Cockneys in California by Joseph S. Coyne. 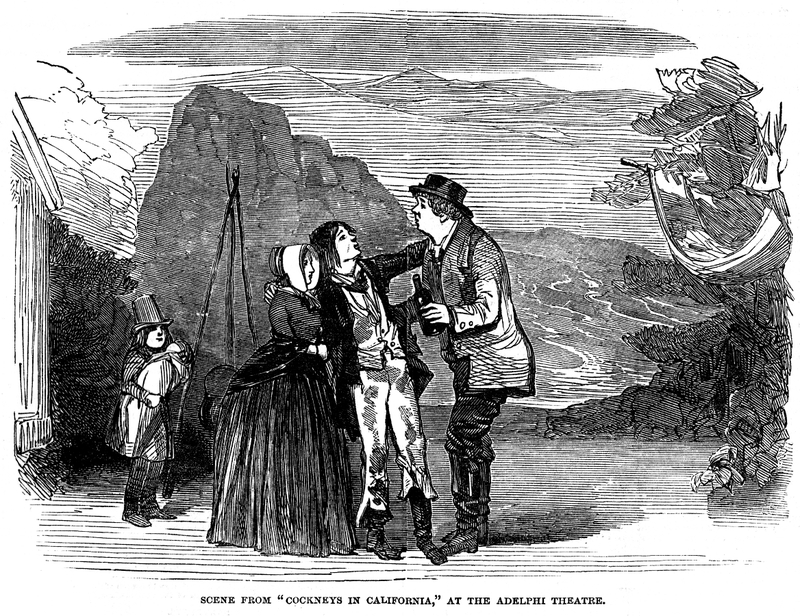 Mr. Coyne is always on the alert for a prevailing topic, which he seizes, puts in a dramatic shape, and brings out upon the Adelphi stage before the nine days' popularity allotted to a wonder have elapsed. If there is no great care evinced in the construction or writing of these bagatelles, yet they answer their ephemeral purpose admirably; and "Cocknies [sic] in California," introduced to the public on Monday, at the above house, will be no exception to the general rule. There is little or no story in it, but Mr. Paul Bedford is the emigrated Captain of a Gravesend steamer; Mr. Munyard is a travelling schoolmaster; Mrs. F. Matthews is his wife; and Mr. Mitchinson is a monkey. All these characters are found in California at the "diggings," and go through a variety of distressing adventures, until at last they determine upon returning home with a lump of gold. The farce concludes with a dance of all the nations assembled at the Sacramento, in which English, Irish, Scotch [sic], Niggers [sic], and Chinese each give a characteristic pas, all ultimately joining in a scramble to the tune of "Yankee Doodle." No time is allowed to the audience to think about what they are seeing; so they laugh, and applaud, and tell their friends to go, and the Adelphi is crowded.